That Brain is a new game studio based in Stockholm, founded by Jonatan Crafoord and Björn Albihn. The duo recently unveiled (via video) their new company and their first project called 20,000 Leagues Above The Clouds, which is filled with floating islands, airships, and steampunk technology. With digital distribution, crowdfunding and mobile proliferation changing the game industry landscape, it's certainly an interesting time to launch a new studio, but Crafoord and Albihn are excited by the possibilities, and in fact, they want to keep things small. There's too much big development holding creative teams back these days, they believe. Crafoord and Albihn have combined experience from companies like Media Molecule, Grin and Gameloft, and now they're ready to take that experience and apply it to something new, or as they say, to create "the seed of something that will grow into an amazing shape, a constellation of individuals to play a big part in defining the future of entertainment." Below you'll find our full Q&A with Crafoord and Albihn about their new project, their views on independent development, how team sizes impact projects and more. Q:How big is your team right now - what's your expected team size as you ramp up development? Jonatan Crafoord:It is pretty much just the two of us! Some other friends have pitched in a few hours here and there. Ideally we want to keep it small, add maybe two or three people to the core team, and work with freelancers if we need help with specific tasks. We're very careful about growing too fast; I think we have seen that happen too often at other companies. Longer term we would probably like to work in a team of no more than nine or ten very talented people, but that's likely beyond this project. Q: Where are you getting funding for 20,000 Above? Are you considering a Kickstarter? "I think one of the main problems with doing AAA games is that the team sizes are getting so big that you can't iterate effectively"
Jonatan Crafoord:Both of us work part time as freelancers, so we fund the game with our own time and savings. More outside funding would help us complete the game faster, and we might do a crowdfunding campaign later if we feel there is enough support around the game. Right now we are focused on building something worthy of that support on our own. Björn Albihn:The upside is that since we have no outer investment, we can keep working on the game until it is complete, not to meet a fiscal year report. We have no rush to do that Kickstarter campaign yet - we want to build a community and following first, and we also want to give that community a chance to play our protoype and get their input before asking anyone to help us out financially. Q: 20,000 Above is currently for PC/Mac - is that just the easy starting point? Why not target next-gen consoles - fears about installed base not being there? Björn Albihn:It's an easy starting point to target the machines most of us have anyway, and it is also a platform we care a lot for. As we are using Unity it is easy for us to expand to other platforms later. Designing and testing the game to work smoothly on every new platform also takes time, and we would rather make a great game on a single platform than a buggy and unfinished one on several. Jonatan Crafoord:We've also worked on console and cross-platform games and know there are a lot of other pitfalls, especially in agreeing on scope with the platform holders and getting the game certified for release. PC and Mac allows us to test the waters, focus our effort and develop the game at our own pace. Q:What are your thoughts on AAA game development these days? A lot of good games don't even break even sadly. How scary is this for a developer, especially one that's making a new IP? Jonatan Crafoord:I think one of the main problems with doing AAA games is that the team sizes are getting so big that you can't iterate effectively. That's probably the reason why new IP is especially risky; it costs a lot if you haven't nailed the design when you've got hundreds of salaries to pay. I think there is a place for new IP in AAA with proper pre-production, but perhaps it shouldn't even be done by the same companies. Maybe we'll even see a split where smaller studios develop the core concepts, and larger studios remake them on a grand scale. I could definitely see us as that smaller kind of prototyping company. Björn Albihn:We think that new IPs and ideas can start small and have an expansive mindset. Many of the AAA brands we see today were originally smaller in scope, and spent their gains on improving on every aspect of their original design. Q: Media Molecule is one of the more unique studios in the industry. What did you learn while there that you can apply to That Brain, whether from a team culture standpoint, creative standpoint or anything else? Jonatan Crafoord:Media Molecule is just a creative explosion - colors, drawings and paper figures everywhere! I think much of it comes from the way they spoil the team. Making games there isn't hard work, it is what you feel like doing after a good night of sleep and plenty of ice cream. Some specific ideas I liked: They had shorter core hours where the team has to be available for meetings and collaboration, with the rest being your own choice of working hours. On Fridays you could sign up to present cool stuff you had worked on to the rest of the office, and I think few things motivated you more than showing your best work to your peers. "In the future I think some of the indie developers might evolve into a new kind of publisher. We're probably already seeing this with companies like Mojang and Rovio"
Finally, the idea to focus on one platform at a time and do it well is actually something Media Molecule were adamant about; they did it for LittleBigPlanet and it worked out really well for them. The biggest inspiration, however, was who they made their games for. There is just something fundamentally satisfying in seeing gamers and non-gamers alike enjoy and be creative with your product, especially when it is across generation gaps. I have friends playing with their children or grandmothers, and I don't know who has the most fun. A: Do you believe that the power in this industry is shifting away from publishers and more into the hands of independent developers? Jonatan Crafoord:I think the shift towards digital distribution has changed the role of the publisher, and that lots of bigger companies are struggling to keep up. Independent developers are suddenly winging the distribution as well as the publishers can, and this definitely shifts the power balance. In the future I think some of the indie developers might evolve into a new kind of publisher. We're probably already seeing this with companies like Mojang and Rovio, who suddenly have a lot of money to spend and know a great deal about the new climate. Björn Albihn:The rise of mobile gaming certainly plays its part as well. It's a very interesting and promising time, especially for the gamers who will find a much greater range of entertainment to choose from. Q: Is this one of the best times to be an independent dev with all the platforms available and the rise of digital self publishing? Or is it more challenging than ever to become successful? Björn Albihn:It is certainly a good time to be an independent developer, and we believe that it can get even better in years to come. There is an amazing amount of technology available to transform an idea into a game, and that keeps improving. There are also a lot of successful businesses focusing on supporting game developers with everything from art to voice acting. Jonatan Crafoord:When it comes to marketing, it is probably easier for indie developers to reach out than it was at the height of retail AAA gaming, but it is also more crowded than before. In the end, if you have a good team and ideas for how to reach an audience I don't think it matters that much when you do your thing. Id Software and Apogee did it in the early '90s with bulletin board systems and mail order. Today's distribution channels are more streamlined but there are also more people on them. It pushes everyone to make better games, so in the end it is all good. Q: 20,000 Above is currently single-player only. Do you feel that companies like Bethesda have proven that that can still work in this marketplace? Björn Albihn:Bethesda has definitely proven that single-player is profitable if done right. The main reason we decided not to go for any multiplayer was that we looked at Torchlight, where veterans from Diablo decided to make their first game single-player only. They didn't even add co-op to their game, which a lot of people expected. It makes sense though, considering the amount of time that needs to go into network code, balancing, servers and anti-cheat on top of designing everything to be fun for one person as well as for a whole party. Jonatan Crafoord:I think there are lots of people who prefer to enjoy a story over competing online. Ideally I'd like to do a co-operative story mode, but once again it is about the constraints and focus of a small team. For now we're doing one thing at a time. I think replayability can be really helpful in selling the game. Keeping people engaged helps getting them to talk about it and getting their friends interested. It is obviously easier to get replayability through multiplayer as other humans are being unpredictable inside your game. With single-player, releasing more content or having emergent gameplay can hopefully give similar effects. Q: 20,000 Above looks a bit like the Dreamcast classic Skies of Arcadia to me, and others have mentioned BioShock Infinite. What are your influences on the project? Jonatan Crafoord:The title is of course borrowed in part from Jules Verne, and we want the world to be influenced by submarine features and old ideas about future technology. 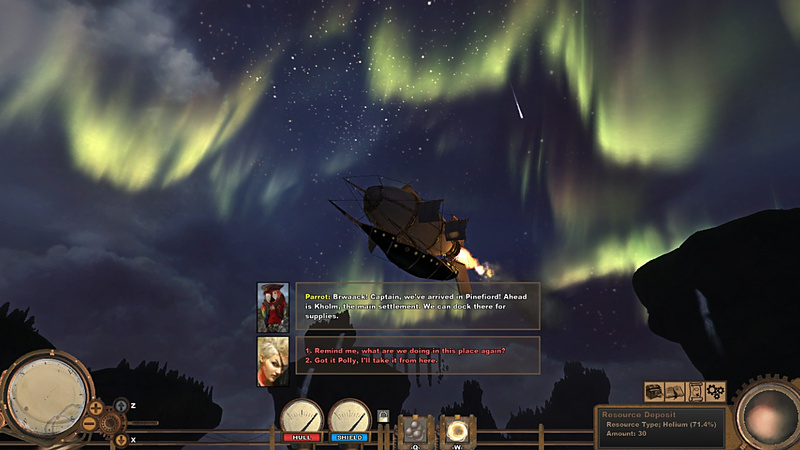 There have obviously been a few games in similar settings recently, such as BioShock Infinite, and also indie games like Guns of Icarus and Air Buccaneers. We don't see this as a bad thing; we think our gameplay will be very different and that their success just shows that people enjoy the setting. Björn Albihn:The main influences on the look and feel are games like Pirates!, Freelancer, Baldur's Gate and Journey; movies and TV-shows such as Firefly, Spirited Away, Treasure Planet and Laputa - Castle in the Sky; Shaun Tan's graphic novel The Arrival; the role playing game Space 1889, and of course the books from Jules Verne, HG Wells and others from that era. The art style is also very influenced by miniature train scenery. Those artists built interactive worlds on a grand scale even decades before home computers. From a development side we are also looking extra closely at Bastion and Torchlight and following how many of the indie Kickstarter games are doing. Q: In your video you say that "small teams can make great and even epic games". That's quite a challenge the way the industry is set up now though. Do you really think a small team can make an epic game on the scale of a Call of Duty or Battlefield 4? Can you elaborate? Björn Albihn:The general impression we have is that small developers are reluctant to do things in high quality 3d because it forces them to create too much content. That is a very sane approach, but we have instead carefully chosen the setting and scope of our game to avoid some very specific time sinks related to 3d game art. We avoid 3d characters and character animations in the game. In our experience these things can sometimes take close to half of the development time. 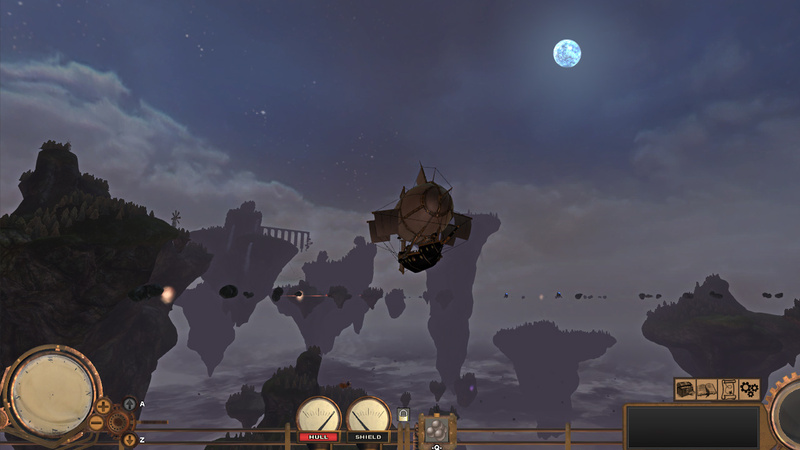 Also, since you're among flying islands the environment art is rarely up close to the player. This means we can create breathtaking scenery by focusing on the big picture. We'll also replace 3d art with 2d art in key places, as it is faster to produce and makes it easier to get a wide range of locations, architecture and characters. Mixing 2d and 3d might even add to the overall sense of quality when done right. Jonatan Crafoord:We do the same thing for dialogue, setting the bar with higher quality recorded voice and filling in with plain text. We also have that approach to the gameplay, which looks very 3d but is actually mostly in 2d layers. All of this allows us to create a mood that is vibrant and open, but with content and gameplay that is relatively easy to produce and test. Add to this that a small team can be much more efficient per hour spent than a very large team. Communication and turn-around is just so much faster. There is no one to ask permission of, or wait for, before diving into creating stuff. We also use good standardized development tools, like Unity3D, rather than trying to create our own tech for everything. Björn Albihn:To sum it up, we think it is very reasonable for a small team to attempt to create a grand experience; the key is to know your strengths and limitations, and to design around them. Sure, we can't provide the audience with buildings exploding in hyper-realistic slow motion every five minutes, but maybe we don't need to either. There are books written by authors that have been labeled epic many times over, and that's just using written text. It's not whether you're big or small. It's how you structure your project management. If you're all groupthinky, have poor project management control and nobody is in control, then a big team will get out of control. But if you centralize your core decision-making and retain only a small core team - letting go of resources that you don't need at project wrap (which, hopefully and smartly, should go off and make themselves up as outfits of their own), then you should be able to control the process. I guess that, despite its supposed drawbacks, there are reasons why it has existed for so long. I guess given the audience that this won't win much agreement, which makes it all the more tragic. No matter how well oiled a machine you think you're working in, you simply would not believe how much work gets done when you slim your team down to single figures, consisting only of the "movers and shakers" from that previous big team. For me it all unfolds when you need a dedicated project manager. He might be the best logistics expert on the planet and won't necessarily be the explicit source of the screw up. It's the need for him in the first place that starts things heading south. Been on both sides of the fence a few times, until I started my own company and got to call the shots on team size. I don't know about others, Paul, but I'm in complete agreement with you. For development teams of up to a dozen people or so, maybe more, there's no need for a "project manager" whatsoever. If your development team can't deal as a team with the estimation and assignment of work, your problem is a not sufficiently competent and/or experienced team, and a project manager isn't going do much to fix that.